One of the many things I am responsible for at the library is updating a main display in the foyer where patrons look for new and hot releases, 7-day loans, books in the news and bio/memoirs. My particular bay changes out every few weeks and aside from the typical holidays, I like to get creative. So…I knew “Mo”vember or “No Shave November” was coming up and the staff got on board with making it educational as well as fun. November is men’s health awareness month and all about bringing back the moustache (Mo), having fun, creating conversations and awareness, and raising funds for men’s health like prostate cancer, testicular cancer and mental illness via various organizations. 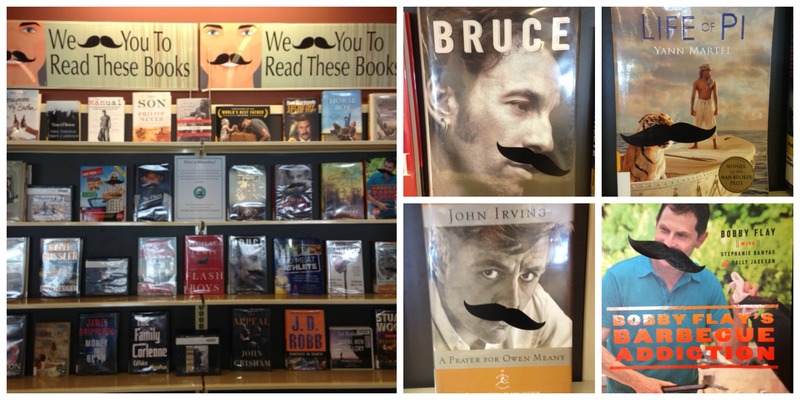 I think we are having too much fun putting the removable moustaches on various books on display. I particularly like the one on the tiger on Life of Pi. Know anyone who is participating in growing a Mo this month? Tags: Library Displays, Men's Health, Movember, No Shave November. Bookmark the permalink. This is such a great idea! I love how you used your job at the library to bring greater awareness 🙂 I don’t know anyone who’s growing a Mo this month, unfortunately. I feel like the “trend” has died down in my group of friends! Thanks! It’s been really fun. Ha, this is amazing! The boyfriend already has a full beard with mustache, so shaving isn’t in the cards for him this month anyway. I hear ya. My husband has always had some sort of facial hair. It’s been a fun display at the library, though.